Mr. James Armstead Hodges, Jr. “Jimmy”, 78, of 8192 Hwy 158 West, Yanceyville, N.C. passed away Tuesday, October 14, at Duke University Medical Center after a short illness. Born December 4, 1935, in Caswell County, he was the son of James A. Hodges, Sr. and Nellie Jones Hodges who predeceased him. He is survived by his wife of 59 years, Mary Fannie Sartin Hodges of the residence. In addition to his wife, he is survived by his son Gordon Allen Hodges and wife Melissa, his daughter Joan Hodges Butler and husband Sam, two grandsons Spencer Sledge Hodges and wife Elizabeth, Garrett Henry Butler and two granddaughters Juliana Miller Hodges and Mary Madison Butler; two sisters Gloria Ann Lewis, Mary Nell Apple and husband Dwayne, and sister-in-law Donna M. Hodges. He was predeceased by his brother William Alvis Hodges. Also surving are two nephews, five nieces and a host of cousins. Mr. Hodges graduated from Cobb Memorial High School where he excelled in football, basketball, and baseball and earned the title “Homerun Hodges”. He played professional baseball with the Cleveland Indians and would later be the General Manager of the Caswell County Baseball League. He worked for Belk-Leggett and American Tobacco Company early in life, but returned to his farming and livestock roots for the remainder of his career. Born into and growing up in the cattle business, he worked at Hodges Dairy Farm and later become the owner/operator of the family business. For many years he was the owner/operator of The Virgimia-Carolina Livestock Market in Blairs, Va. and in partnership with his son helped establish Pineview Farms. 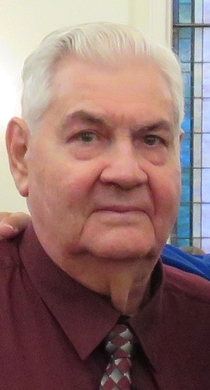 He was a founder and long time board member of Piedmont Academy and also served on the board of Casville Volunteer Fire Department. He enjoyed cooking good food especially hosting Fourth of July BBQ’s for neighbors, friends, and family. Services will be held at Harrelson Funeral Home, Yanceyville, N.C. on Saturday, October 18 at 11:00 AM with Interment following in the Sledge Family Cemetery at Providence Baptist Church. The family will receive friends at the funeral home on Friday, October 17, 6:00 PM – 8:00 PM and at other times at the home. Memorials may be made to Casville Volunteer Fire Department, 10886 U.S. Highway 158 West, Ruffin, N.C. 27326. Very sorry to hear about Mr. Hodges. He was always polite & kind to me. Joan you and the family are in my thoughts & prayers at this sad time.